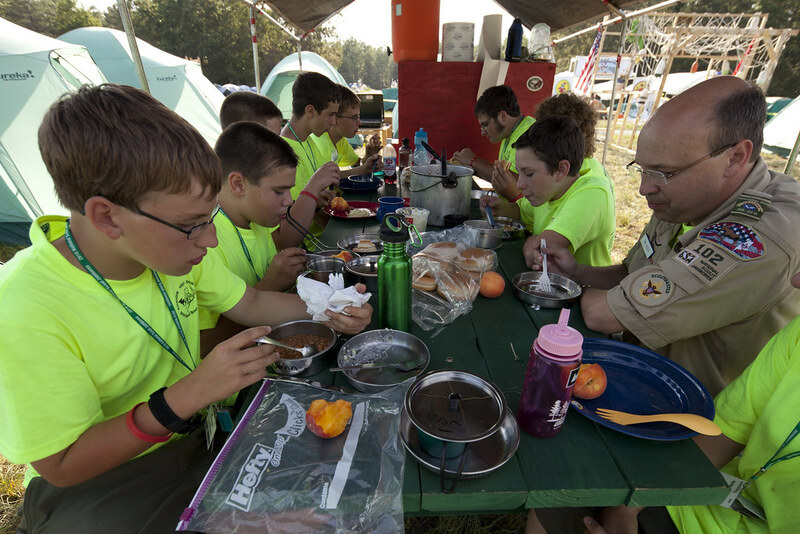 Subcamp 9, Western Region is the jamboree’s largest subcamp with 54 troops consisting of 220 patrols. Gary Williams, the subcamp commissary officer from Denver, Colo., and his staff have a lot of food to distribute. By the end of the jamboree, subcamps will have distributed 35 meals each Scout and Scouter with a total food cost of more than $5 million. Working in his fifth jamboree, Williams has his mind on the numbers. Each night 15 pallets of food, one pallet of milk and 500 bags of ice are delivered to his subcamp. Every subcamp receives similar deliveries. All the food is then inventoried, divided by the commissary staff into plastic totes and one tote per patrol is distributed each morning and evening. This enthusiasm spreads to the rest of the commissary staff. Hannah Alamogordo, N.M., is at her third jamboree to serve Scouts because she enjoys her interaction with the troops. But she does not even try to keep track of the amount of food that comes through the tent. “My brain would fall off; it would go to mush,” Keeler said. Twelve lunch kiosks are spread around the jamboree where all participants collect lunches between 11 A.M. and 2 P.M. Small plastic tags provided to each participant serve as kiosk lunch tickets that allow Scouts to claim a lunch bag. Scouts and Scouters visiting for the day are not issued lunch tags. When it comes time for some ice-cold refreshment, such as a soda or ice cream, there are concession stands and vending machines dotted throughout the site. A few private concessionaires sell specialty foods as well. To feed approximately 5,000 jamboree staffers, who eat at the five staff dining halls, a projected 162,000 meals will be served by jamboree’s end. More than 50,000 of those meals have already been served. For the first time, this is a peanut-free jamboree, where no food served in regular meals has peanuts or peanut oil. Peanut butter is still served for those who like a bit of choice. Boy Scouts of America has contracted Compass Eurest to provide food for the jamboree. This company was used for the 2005 jamboree and serves Philmont Scout Reservation.